QUESTION: Hello Martin, I understand and agree to what you are saying in your post however I cannot understand what you mean when you say that: “Secondly, leaving all individual member states with past debt yet converted that to euro, then resulted in their debts doubling in international value as the euro doubled going into 2008.” Here, I cannot follow how it is possible that Greece’s PAST debt could double due to the euro doubling in value since the PAST debt has already been converted to euro. If the PAST debt had been in any other currency and then when the euro would double then I could understand that the debt also could double. Am I missing out something here? ANSWER: All members past debts were in their home currency, including Germany. 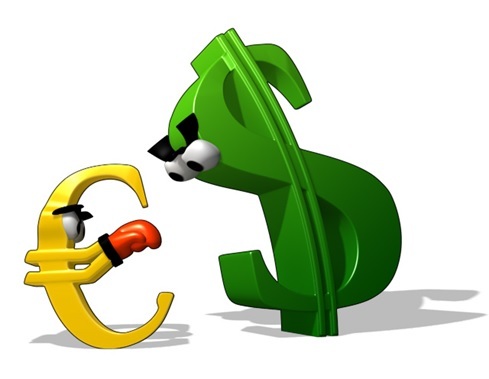 Upon joining the Euro, the past debts were also converted to the Euro because their old currencies were abandoned. What I mean by international value is if you look at the debts of all member states, when the euro doubled in value from 80 cents to the US dollar to $1.60, from a US investor, he doubled his money holding Greek debt or any member’s debt. 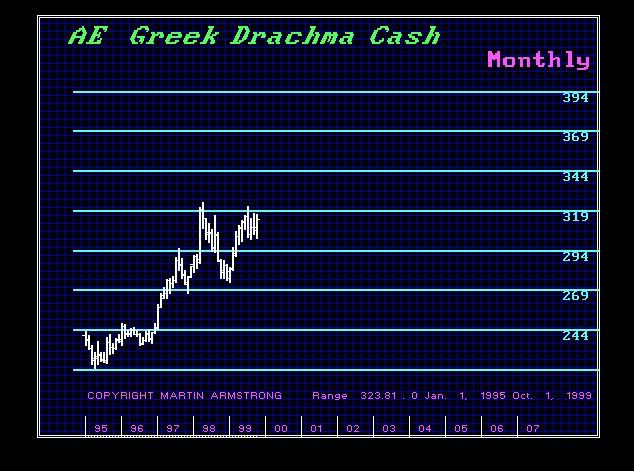 We can see that the dollar rose sharply against the drachma between 1995 going into 1999 demonstrating that the drachma declined 47% going into the formation of the euro. The cost of servicing the past debt rises in real terms and when they had to pay off the debt and roll into new debt, they were paying in international value more than it was worth upon joining the euro. Back during the Reagan Administration, I met with the U.S. Treasury and warned that Volcker raising rates to 14% meant he was suppressing inflation immediately, but causing it to exponentially rise by the end of the decade. Why? Because central banks cannot stimulate or suppress and economy with interest rates when the government is the biggest borrower. Whatever they think they are doing by raising rates to stop people from borrowing has no impact upon government for they will always spend other people’s money freely. In that meeting, I was flatly told it was OK because the government would be paying back with cheaper dollars. 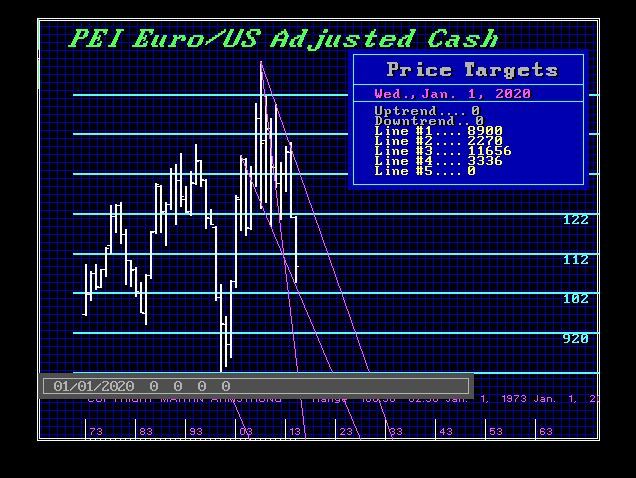 In this case, the rise in the euro to $1.60 meant the opposite – member states would be contracting and had to pay out huge sums beyond what they originally owed. This was no different from people who took out Swiss loans and then the Swiss franc/euro peg broke. Suddenly the borrowers owed q lot more in their home currency when the Swiss rallied. Consequently, the past debt of Greece was in drachma and the decline in the currency meant that its debt in terms of dollars (international value terms) fell almost by 50%. Upon joining the euro, the past debt was then converted to euro – not before. Therefore, in international terms of value, the debts effectively doubled in real terms. This would NOT have been a problem had all the debt of member states been consolidated into a federal debt for Europe. Thereafter, any new borrowing would have been purely state debt NOT acceptable for reserves in the banking system. In this manner, the past debt, which does not stimulate the immediate economic position, doubled in real terms and increased the cost of servicing the past debt. This is how the economy was strip-mined. Had the debt been consolidated into one federal debt, that burden would have been relieved upon by member states. This would have allowed the euro to then actually compete against the dollar. It is likewise a total joke that people think China and Russia can sell US bonds and somehow that will dethrone the dollar. Pension funds and institutions in Europe and the US will not suddenly sell all dollars and buy rubles and yuan denominated debt. There is such a thing as credit ratings. As long as federal debt exists and pension funds are compelled by law to own government debt, you will not dethrone the dollar simply by trade or any combination of China and Russia. That is just absurd. The big money simply cannot move to rubles and yuan. A lot more has to change.